Gov. 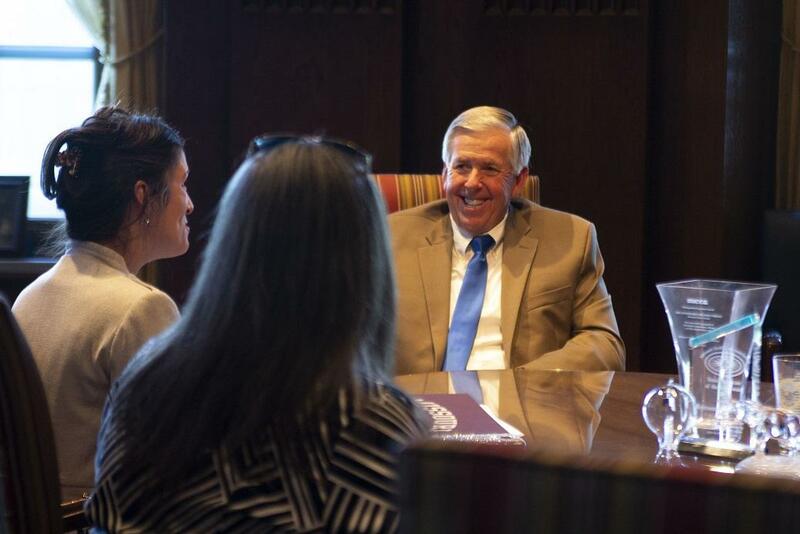 Mike Parson talking with Jefferson City Mayor Carrie Tergin, at far left. Parson served as an MP in the Army and spent 12 years as Polk County sheriff before being elected to the Legislature and then lieutenant governor. He succeeded Eric Greitens as Missouri governor on Friday. Kansas City Mayor Sly James, who was at Tuesday’s meeting, called it productive. One issue they talked about was upgrading transportation infrastructure, with the mayors voicing support for raising Missouri’s fuel tax this November. Parson didn’t exactly endorse it, but he indicated that he would support it if the majority of voters do so as well. The other mayors who met with Parson on Tuesday were Kathy Rose of Riverside, Brian Treece of Columbia, Len Pagano of St. Peters, Karen Best of Branson, and Carrie Tergin of Jefferson City. He plans to meet with St. Louis Mayor Lyda Krewson. Parson’s office also announced more staffing hires in a written statement issued late Tuesday. Marylyn Luetkemeyer will serve as executive assistant to the governor, Robert Knodell as deputy chief of staff, and Kelli Jones was officially announced as press secretary. The new governor also met briefly with legislative leaders ahead of a joint address he’s scheduled to deliver on Monday. An exact time hasn’t been set.